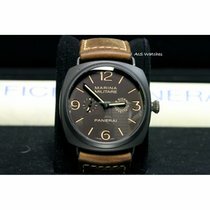 Panerai Radiomir Composite Marina Militare 8-Days "Giorni Brevettato" PAM 00339 Limited edition of 1,500 pieces. Matt dark brown Composite case diameter 47mm water resistant to 100 meters, to produce the case Panerai used a composite material which is the result of an electrochemical process of ceramization of aluminium. Panerai submerge aluminium cases in a chemical bath where it undergoes the process of ceramization, the material is light and harder than metals like steel and titanium. Hand wound mechanical P.2002/7 movement with 8-day power reserve. Tobacco sandwich dial with seconds sweep sub-dial, distressed leather strap with beige stitching. Box and papers dated February 2011. PAM 339.